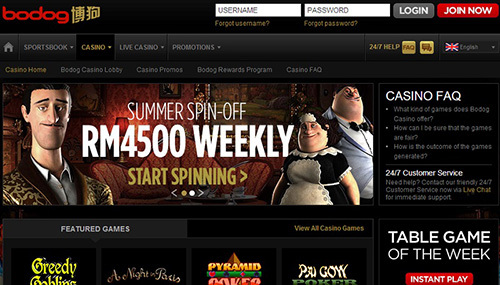 Bodog is the world’s largest online gaming brand. Founded by Calvin Ayre, the Bodog brand has spread across the globe and encompasses many online casinos. One of the largest, Bodog88 (博狗), offers a complete suite of gambling services from casino games to sports betting, poker, mobile casino, horse racing and live-dealer table games. Their software is exceptional, providing the best entertainment value on the internet, and the live dealer broadcasts are excellent. Bodog88 is a trusted brand which doesn’t hide anything from its customers. Their site is available in Mandarin and English and is highly informative. The casino makes use of several good quality software providers and has a range of games to show for it. Unfortunately, players outside of Asia can only play using foreign currencies, which lowers the casino’s overall mark. With such a reputable name in the industry, this is certainly a great casino for Asian players. There are several bonuses available, and since you can play any portion of the website from your one account, choose the bonus that fits you and your play needs (sports book, casino, poker). In addition, bonuses are different for each country, so you’ll have to check for yourself. Make sure your read the fine print regarding rules and rollover requirements. Bodog88 has a tendency to try and offer new exciting bonuses on a regular basis, which is great, but it makes keeping track of them tough. For players that want access to the casino, a 100% deposit bonus is available. A simple €50 bonus with a 30-times rollover is a current option. For players who play roulette, the bonus and deposit are added together to get a total of €100. You can play a number of different roulette tables, but your total wagers must be over €3000 before you can withdraw any of your cash. There is also a new-player, risk-free option that allows you to claim an overall loss of up to €40, which will be credited back to your account. Find these bonuses first, to make sure they are current! Currently Bodog88 is offering a 0.4% rebate on weekly betting volume. That means whatever you play, win or lose; they will credit your account with a free deposit for complementary play each Wednesday. No comp play is added until your bonus is cleared. Afterward, as an example, should you play roulette for three hours at 100 spins per hour (you can go faster!) and an average wager of €4, your total volume would be 3 x 100 x 4, which equals €1200 x 0.4% for a rebate of €4.8. Bodog88 is a full-suite of gaming, with prime sports wagering (money lines, point spreads, future wagering, etc.) on world-wide events, horseracing, slots, video games including poker, live poker, electronic table games like roulette, craps, blackjack, baccarat, Sic Bo, Pai Gow poker, and of course their specialty – live dealer games. There are hundreds of slots and video games to choose from, so you are likely to find exactly what you want and the sound and graphics are great, but the focus, again, is on live dealer games. So what can you expect? Streamed direct from Manila, the live games are wonderful to watch and play. Dealers are fun to see dealing the games and they are very professional. There is no live chat available, but you can join a table and play immediately from your bankroll. There are several tables to choose from, but multi-table play is not available. Games include Sic Bo, Dragon Tiger, Baccarat and Roulette. Live and electronic roulette at Bodog88 can be played on a traditional French wheel with a single zero. En Prison and La Partage are not available. Limits run from €1 to €500 and your can expect a new spin every 25-seconds. A standard layout is in use with a separate track for wagering on Tiers, Orphans and Neighbors. There is also graphics shown for hot and cold numbers, as well as a complete history section to see just what has transpired recently. The casino operates an online sportsbook, casino games, Poker room, mobile casino, and a Live Dealer Casino aimed at the Asian playing market. The casino has a broad range of slots ad jackpot slots. Unfortunately, there are not so many Roulette games on offer; just a couple of editions of American and European style Roulette. On a positive note, fans of the game have a good selection of Live Roulette to choose from. There’s no shortage of activities at Bodog88 Casino. The casino is powered by Microgaming, UC8, iSoftBet and Pragmatic Play. 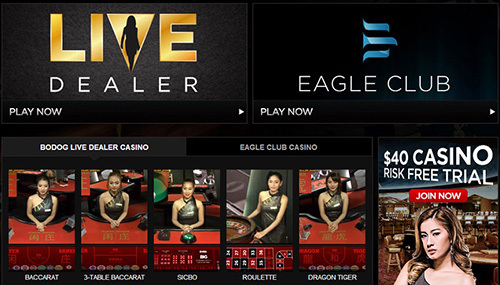 The Live Dealer Games are provided by Asia Gaming, Ho Gaming, Deluxe Gold and SA Gaming. One Works is the driving force behind the sportsbook, and Pai Wang Luo powers the casino’s Poker room. Make sure you have met all requirements for clearing your particular bonus for your particular country before attempting to cash out. You can check on your bonuses and status at the cashier. Withdrawals will only be processed after you have verified your account information (photo ID, street address, etc.) via email or fax. And, don’t expect your first withdrawal to be fast. Once all aspects of your account and withdrawal have been met, checked, rechecked, you’ll get your cash via the same system you used to deposit. You can check on the status of your deposit or withdrawal at the cashier at any time. To open an account with Bodog88 Casino, you must have an active account with either China, Malaysia or Thailand. The casino therefore only accepts the following currencies: Bitcoin (a peer-to-peer digital currency), Renminbi (RMB), Malaysian Ringgit (MYR) and Thai Baht (THB). The casino also offers few payment methods, such as bank transfer, debit cards, Quickpay and cash deposits using an ATM or over the counter at your local bank branch. Bodog88 Mobile Casino is aimed at players who prefer to use their smartphones and tablets over desktop to play their favourite games. The mobile casino also focuses on the Asian market. Clients can choose to have their betting options displayed in either English, Chinese or Thai, making its gaming services available to a large group of people. One drawback is that not all the games are available to play on mobile as are offered on desktop. There are also plenty of exclusive offers to mobile users who just have to scan the QR code from the gambling site to receive them. The casino is compatible with Android, iOS and Mac devices. Bodog88 Casino has an array of jackpot slots in its games catalogue which come with some life-changing prizes. These include A Night with Cleo, Absolute Super Reels, Mega Moolah, Mega Moolah Isis, Tunzamunni, Major Millions, Neon Reels, and Fruit Fiesta. There are also some jackpot table games like Caribbean Hold’em and Caribbean Stud Poker. Curaçao eGaming fully licenses the casino; it’s authorised and regulated by the Government of Curaçao and governed by the Cagayan Economic Zone Authority (CEZA) in the Philippines. Bodog88, just like Thrills Casino, uses a sophisticated Random Number Generator or RNG to randomise the outcome of games. It is TST certified as proof that the games on offer are fair. Bodog88 restricts players from Hong Kong, the Philippines, and the United States. Hong Kong, Korea, Korea, Philippines, Taiwan, United States of America, Vietnam. Bodog88 is one of the best online casinos and offers great live play. They get a high rating for ease of deposit and ease of withdrawal, and the highest rating for their overall group of betting options – sports, casino etc. They also get the highest rating for the sheer number of games available.